I saw the dirt. It disgusted me. How could she stand there in her house and let her window look so awful? I couldn’t imagine letting mine collect all that grime. I couldn’t help but stare as the woman struggled to care for her house. She vacuumed and dusted. She wiped down the counters and made meals. She took out the trash and she smiled at all those who came into her small home. What hypocrisy! Her window stood neglected while all else was tended. I stared as she fell on her knees in grief. I watched her scream and rail against the walls, but then grow quietly peaceful as she looked toward heaven. I saw her dance when the good news came and I watched her cry when hard news brought its loss again. I vigilantly watched her life, but I could not ignore that dirty window. I saw everything through the smudges, the dirt, the trash, and the very things I would never neglect to care for. Even so, her genuine heart welcomed person after person and she served them with such love, but that window tainted everything for me. I walked to her house and feigned friendship. I brought over coffee and fresh-picked flowers from my home. I brought her the best of myself to show her what it meant to live well. I wanted to boast. She sipped the offered coffee as she removed her own flowers from her best vase and replaced them with the ones I had picked for her. She had no other vase, so her flowers were put in a fading plastic cup. I could see how she valued my gifts. I squirmed in my seat. She said, “This is better than the coffee I make! Can you show me how you do this?”. I fidgeted and folded my hands nervously. “Sure” was all I could manage and I hastened to look at her window to validate all the judgments I had stored away. But her window wasn’t dirty. There were no smudges. No dirt. No cobwebs. It was spotless. How could it be? My discomfort grew tenfold. I excused myself as politely as possible and ran back to my own home. I could not have imagined such disgusting grime! I tore through my house and did not care about my muddy footprints scattered throughout. I stood at my window and I could see the dirt! Smudges, grime, grit, cobwebs. I hadn’t imagined anything, but I had overlooked everything. It was my dirty window not hers. It was my dirt, my grime, my grit, my cobwebs, and my neglect. For all these months, I had judged her when the dirty window was mine! I scraped at my windows and I worked to remove the disgusting neglect I had collected. But nothing would be removed. No amount of scraping, scrubbing, or wiping could clean my window! I ran to her house. This time I bore no extravagant gifts. I was tired, unkempt, heartbroken, genuine, and desperate! But my window needed cleaning, and I couldn’t do it. I couldn’t do it! Oh I knew about grace, God’s grace, the abundant grace, the never-ending grace! I believed in God! But I wanted my window clean. That’s all I wanted. I sputtered unintelligently, but she didn’t’ let me finish. “God’s grace,” and she began to elaborate. “A few years ago, I would stand at my window and stare at your home. I would wonder how you could be so loving to all those who entered your home, but I could never understand why you’re window was so dirty and neglected. But one day I realized that it wasn’t your window that was dirty, it was mine. My crying had subsided as hope was breathed into my heart again, in a house I had long detested; listening to a woman I had incorrectly judged. I remember the season when I depended on God for everything. It was a beautiful season. How could I forget my need for Him? She continued, “Sometimes, I still stare into your home and wonder how it can look so beautiful. When I start to fixate on your dirty window, I just look a little closer and realize it’s my dirt, not yours. I ask God for forgiveness, grace, and strength. I look again and my window is clean. It’s cleaned every hour, I think. She laughed then. It was a beautiful sound. “I am wilted, wounded and struggling, but God’s grace is abundant!” She finished just as the coffee was done brewing. She poured me a cup and sat with me quietly. I had much to think about, for I had long relied on my own good works and outward appearance to make a beautiful life. I had neglected my window, because I was proud. Today, I was broken. 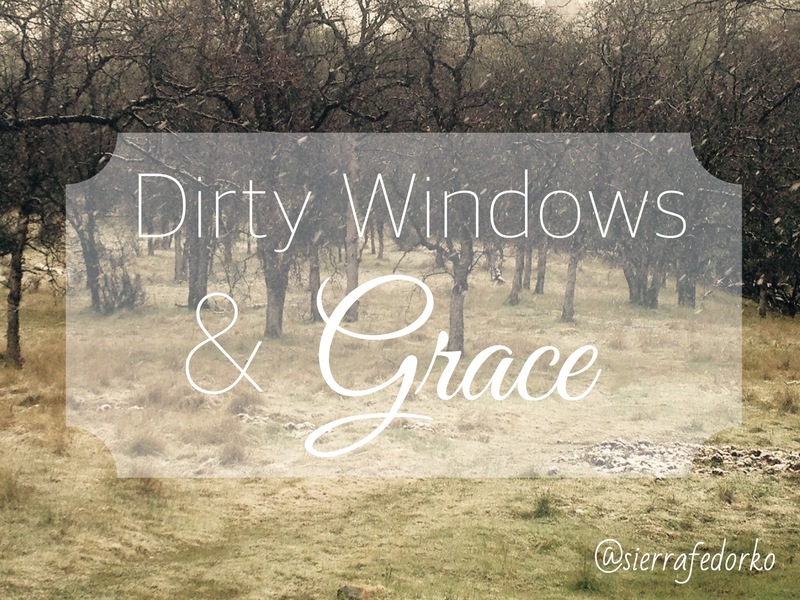 Today, my dirty window would receive God’s grace and perhaps it would a hundred more times this very hour. And somehow there was hope in the monotony of that thought! My dirty window would always have hope. It would always know grace. God would never abandon it. “But where sin abounded, grace did much more abound.” His grace is so amazing, and I am SO grateful for it! Have a great day living with His amazing grace! Thanks for the story because it was an encouragement to my heart when I read it a couple days ago!! Thank you, Rose for this kind comment & for reminding me of this verse! I love this truth from God’s Word!